My Killer Homemade Pizza Recipe! 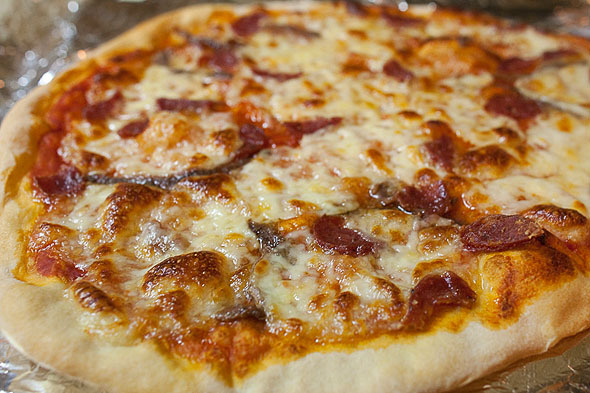 Why you may ask, are you having a pizza recipe on a photo blog?!? Well, first of all, I’m straight Italian and sick~n~tired of eating “chewing gum pizza”. Beside that, if you are into photography, chances are you might like cooking as well, since it is a form of art. 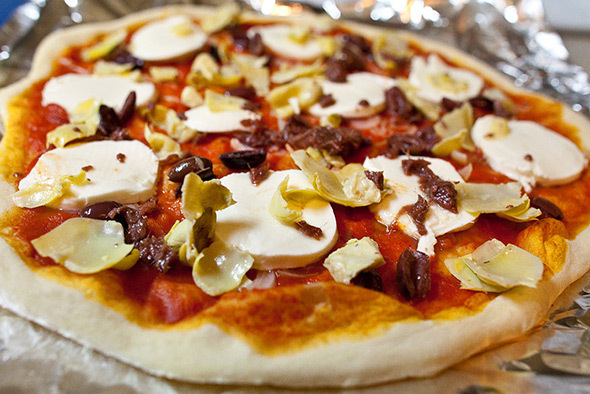 So here we go…all aboard and get ready to make your very first homemade pizza, save some money and brag about it too! 3 1/4 cups of unbleached bread flour is BEST (not self rising of course), Italian Bertolli Extra Virgin Olive Oil (if you don’t find unbleached bread flour use just unbleached, I use and *LOVE* King Arthur unbleached bread flour ). Otherwise plain bread flour will work too. 1 pound (450 grams) of mozzarella (better if “Mozzarella Di Bufala In Water ” my favorite is Whole Foods mozzarella called Ovaline, yes it comes in water) or provolone cheese sliced or chopped, otherwise try to find whole mozzarella, NOT SKIM, “Bel Gioioso” brand is fine and VERY GOOdtoo. Do not buy any hard blocks of mozzarella or you gonna be wasting your time, it has to be very soft ! Buy the “plainest” sauce you can find! Look at the ingredients label, all you really need is plain tomato sauce! The less ingredients in there the better the taste! Put the yeast in a small bowl and add 1 and 1/4 cup of very warm water (better if bottled water!- about 110 F), mix up and let sit for about 3 minutes. Put the flour in a large bowl and add the 2 teaspoons of salt and the extra virgin olive oil in there and mix. Add all the water with the yeast slowly in the big bowl with the flour while mixing with a wooden spoon and add the tablespoon of extra virgin olive oil at the end. After added all the water feel free to add more if you think it needs it…or if it’s too soft add a couple of spoons of flour til the right consistency. When the dough gets…well looks like a dough, spread a little flour on a large cutting board and Knead for 6 to 8 minutes, until you have made a smooth and soft dough. Cut the dough in half an make two balls. Put the dough in two lightly greased bowls with olive oil so it won’t stick. Cover the bowls with thin foil and put in warm (…quiet…place..SHHHhhhh) microwave or oven (OFF of course! )…not in the refrigerator. Let sit for 1 and 1/2 hours at least. Preheat the oven at 450 F (232 C) with the pizza cooking stone in there. Sprinkle a tiny bit of white flour on a wide piece of tin foil about 18×22 inches wide (so you can grab the pizza later on and won’t get stuck) and put a ball of dough on it. Spread it with your hands and/or roller until you get a disc about 15-16 inches wide, about 1/8 of an inch thick. 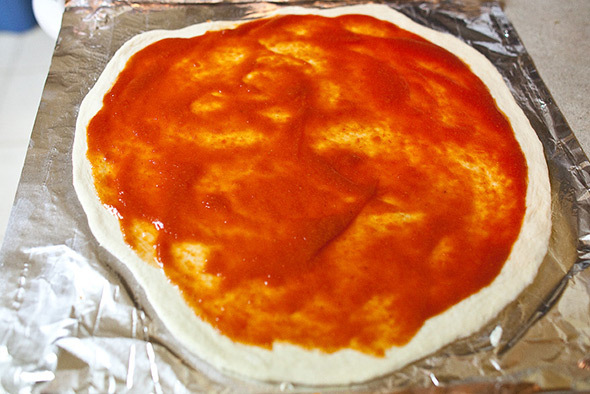 Put about 3-4 large cooking spoons of tomato sauce on it and spread…( American pizza has way TOO MUCH SAUCE!) and drizzle all over a tiny bit of extra virgin olive oli. Grab the thin foil (you may need somebody to help you, since you don’t want the thing to fold over! To prevent the thin foil from folding over hold the ends of it tight, don’t give no slack) and place it right on the hot stone and cook for 7 minutes at 450F. Take the pizza out and spread 1/2 pound of mozzarella (or less:) on it, and other toppings you may like, ( While the pizza is out do not forget to close the oven so temperature don’t drop) and put back on the stone and cook for another 10 minutes; when one minute is left set the oven to broil – HIGH so the mozzarella gets some nice darker brownish spots. 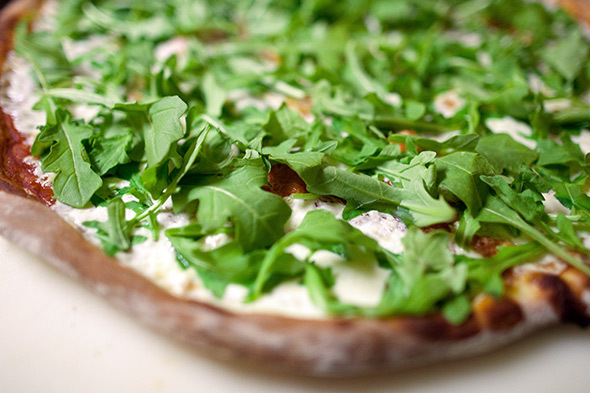 Once the pizza is done garnish with a few leaves of fresh basil if you have the luxury of having it in you herb garden. 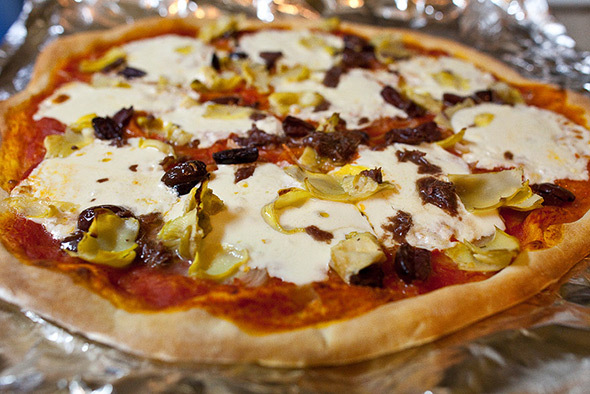 To separate the pizza from the tin foil, place the pizza on the counter, let it stick out about 25% and pulling the thin foil down keep on rotating the pizza until separated from foil.